Were you part of our last little Feet, Big Steps Christmas Empowerment project? 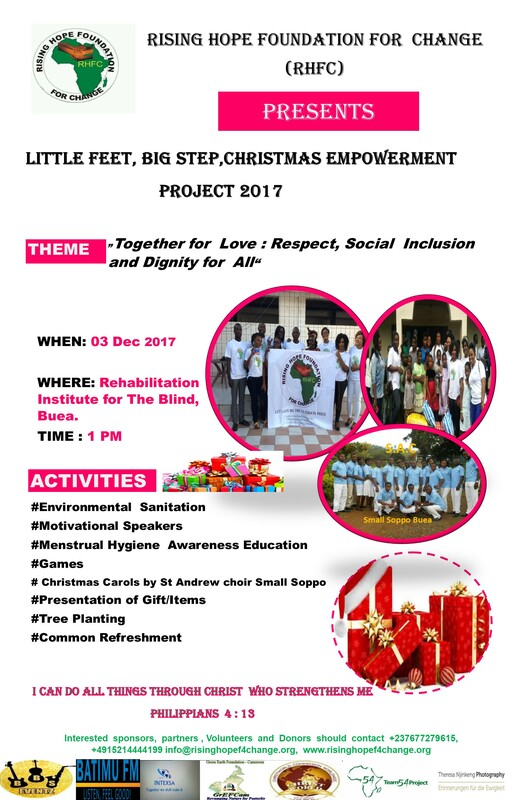 Our Little Feet, Big Steps Christmas empowerment project 2017 is here and you can’t afford to miss. May the miracle of Christmas fill your heart with warmth and love. Christmas is the time of giving and sharing. Join Team RHFC in showing some love to the underprivileged (orphans, physically challenged individuals, street children and the girl child) in our communities in Cameroon. To partner, support or sponsor our Little Feet, Big Steps Christmas empowerment project 2017, please send us a mail to info@risinghopef4change.org or call us on +4915214444199, +237677279615, +2376975899.